Majestic Cabinets LLC can build your very own, one of a kind space in Las Vegas, NV, complete with custom cabinets for your office, kitchen, bar, entertainment center, display case, or any other space you can dream of. Our expert design services, diverse choice of materials, efficient project management, and quality craftsmanship ensure that your project is on target from start to finish. Explore the many exciting possibilities when you design your own custom cabinets in Las Vegas by our local cabinet builders. Say goodbye to your ordinary laundry room, garage, or staircase. With the flexibility and design style you choose, you can strive for excellence with unique pieces and custom styles. Majestic Cabinets gives your project the extra time and professional detail that your project deserve. Call us today to let our experienced staff know what your ideas are. We’ll make your state-of-the-art custom cabinets with creative function and style for your Las Vegas lifestyle. Majestic Cabinets has specialized in hand-crafted custom cabinets in Las Vegas and small bathroom cabinets for over ten years. As experts in luxurious architectural woodworking, Majestic Cabinets will build, finish, and install your custom cabinets in Las Vegas, working with your schedule and satisfaction in mind. Our custom-built kitchen and bathroom cabinets, media centers, and distinctive wood furnishings will transform your ordinary room into a grand escape. With impressive attention to detail, we have the ability to solve space problems and design high-quality custom cabinets in Las Vegas. Let our expert designers guide you through our thousands of options between styles, hardware, and, of course, colors and stains. Our hands-on approach assures that every wood-working design receives personal attention and expertise. Majestic Cabinets has built an impressive reputation for quality cabinets in Las Vegas with outstanding design and customer satisfaction. Call Majestic Cabinets today for custom cabinets in Las Vegas, North Las Vegas, and Henderson! When planning for a remodel, cabinets and shelving are essential components to consider. Custom cabinets can transform any space into a beautiful and truly unique room that is sure to inspire any guests you invite to your home in Las Vegas. 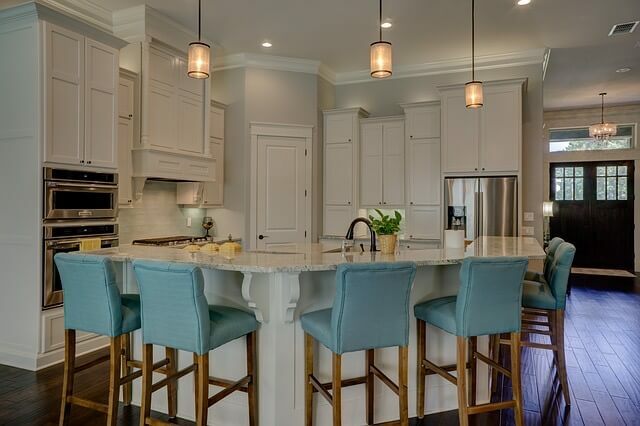 In many homes, the kitchen tends to be where families gather to cook, laugh, and share meals together. Unfortunately, some kitchens were poorly designed with a less-than-functional arrangement of the space. Custom space-saving cabinets can cut clutter, making your Las Vegas kitchen more desirable to spend so much time in. Storage accessories, like roll-out shelves or trays, roll-out waste & recycle drawers, “soft-close” doors and drawers, Lazy Susan racks, spice racks, etc. can greatly improve the functionality of your kitchen. Aside from the kitchen, you and many of your guests will also likely visit your bathroom. Bathrooms have a tendency to be a very necessary, yet mundane part of any home. The bland amenities don’t typically add much inspiration to the room either. The real centerpiece of any restroom is it’s vanity. Custom cabinets, countertops, and lighting can set your Las Vegas bathroom apart from the rest by offering not only storage, but also style and character. Entertainment centers are another area where custom cabinets can transform how you and your Las Vegas guests feel in your living room. 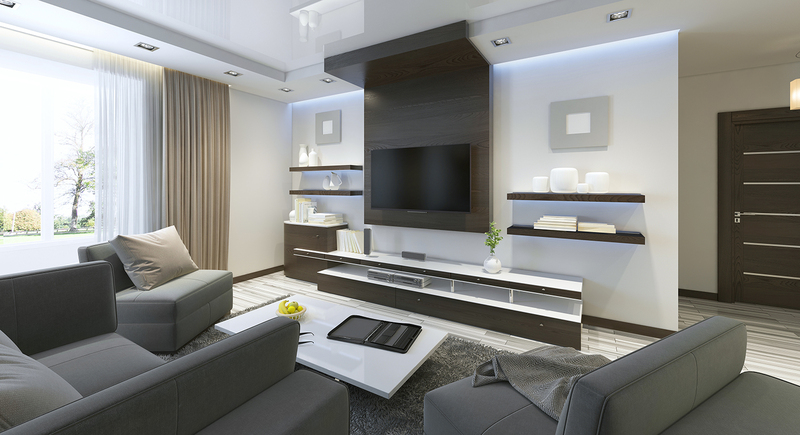 Accommodate enormous televisions and other electronic devices, build-in secret compartments, showcase what’s important to you, and hide your clutter with custom cabinets for your home in Las Vegas. No matter what you have in mind, custom kitchen and bath cabinetry to closet and garage storage concepts, Majestic Cabinets can design your dream and deliver a quality product for your home or office.